Ambush at De Hoop [DaE1] – Attenzionen!!! In this scenario I will first use the solitaire play rules for ASL provided by Mike O’Leary. For each HIP (hidden in place) British counter I add a British ownership counter. They denote all the possible HIP locations between which the British hidden units can switch places. The DaE scenarios center on engagements between various German ad hoc units attached to the II SS Panzer Corps and elements of the 43rd Wessex Division during Market Garden. 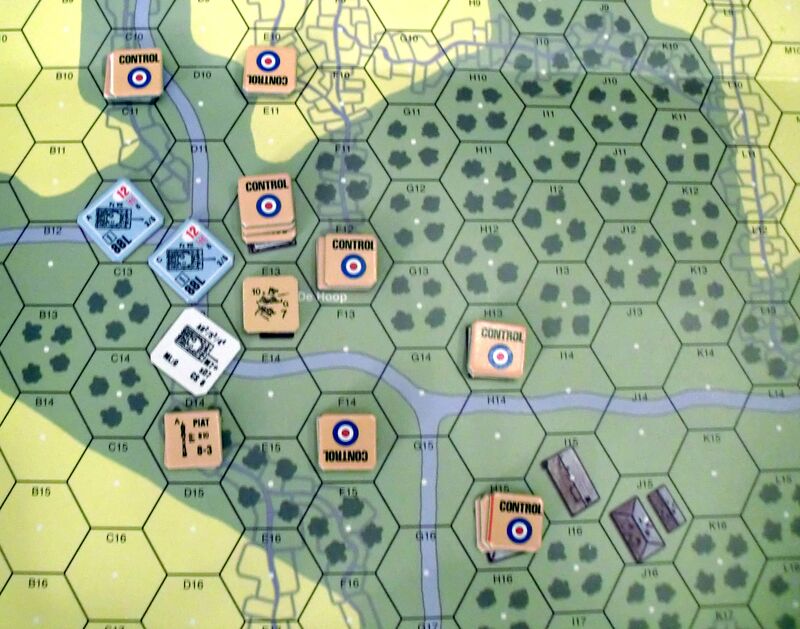 This specific scenario pits 3 Tiger tanks from Panzer-Ersatz-Abteilung 500 (this translates to Tank Replacement Battallion) against elements of the 5th Battalion, Duke of Cornwall Light Infantry (5th DCLI), 214th Infantry Brigade. In the real event 5 Tiger tanks were hit in a night ambush on the 22nd September 1944. Here no night rules are used, however all British are HIP in ambush. Turn #1: the German heavy tanks rattle along the road with their crews wearily scanning the road sides and window openings for any would-be enemy. Then suddenly the lead tank is hit in the side hull and comes to a standstill, the crew neutralised. The second PIAT fails to hit exposing its squad in a wood building. Some MG-bursts from the second Tiger forces a MC1 which the squads just fails to pass. The remaining German tank crews button up as to protect themselves from British small arms fire. 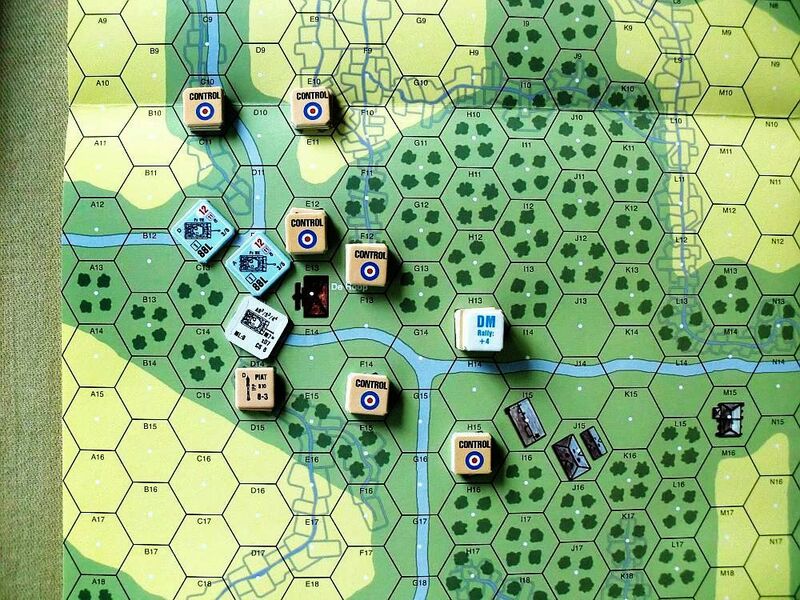 The British rearrange via HIP shift rules to encircle the German tanks for further attacks. 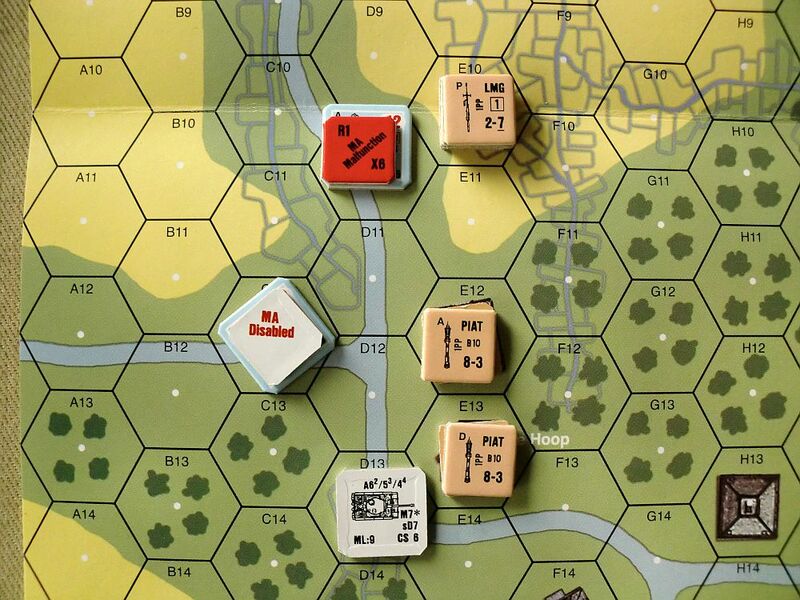 Turn #2: As one Tiger backs away from the known PIAT position he is hit in the side hull from an PIAT round comming from the stone building in E12, but to no effect. The tank backs away further up the road blasting away at the threat until its main armament the 88mm gun malfunctions. The British 8-1 leader rushes his squad to the polder north of De Hoop. Meanwhile the squad in D13 and the third Tiger battle it out near the T junction. The tank is hit in the turret plate with no effect but the squad receives a near HE blast breaking its fighting spirit. 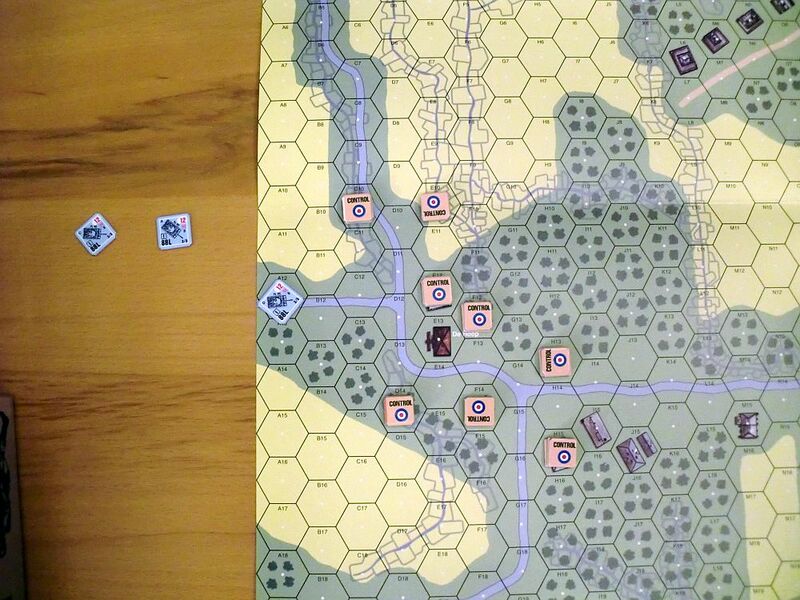 Turn #3: The third Tiger’s gun malfunctions probabely to inferior late war or even sabotaged ammunition. Its MG fire rips into the squad in the stone building breaking ist morale. The last remaining British squad fires its PIAT hitting the side turret of the Tiger still reversing up the dyke road. 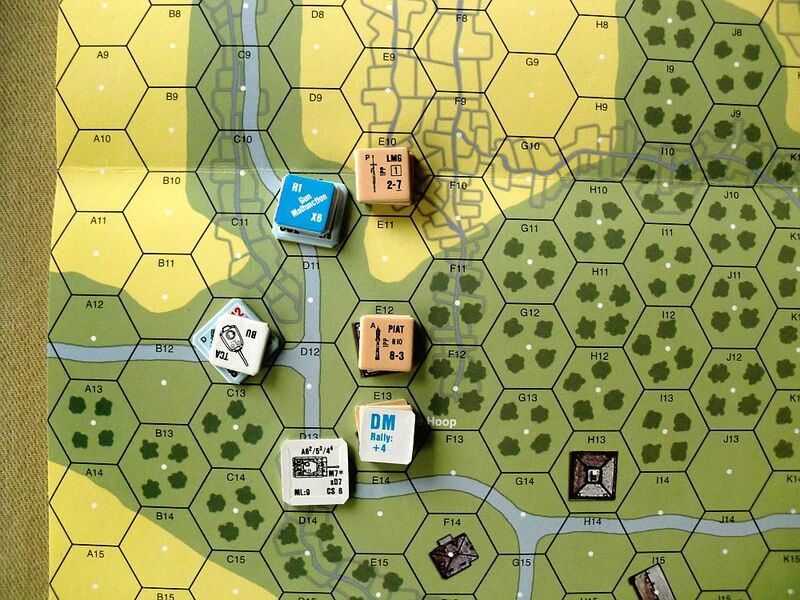 The round fails to penetrate but does inflict shock on the crew bringing the tank to a halt. The German tank crew in D10 recovers from the shock but the Tiger in C12 loses his main armament due to a failed recovery dr. All following exchances of fire remain ineffectual. Both sides are quite shaken as the scenario ends. Although the DCLI could not repeat the brilliant show they exercised in the real event they win. With no Tiger remaining with its main armament functioning the victory goes to the British as of the scenario’s victory condition. The solitaire rules cater excellently for HIP in solo play. I am eager to try concealed placement and dummy counters. Weapon malfuctions are bad news. The Germans could easily have won the scenario if they had refrained from using the main armamant. With the victory conditions as presented in the scenario one should think twice before risking the main armamant. The PIAT is not powerful enough to penetrate the turret of the Tiger. Hull hits are needed. Thus the tanks need to be confronted from all sides as to make sure that hits have a chance to kill. Despite of the short scenario time frame it is advisable to wait until the German tanks have moved well inside the trap. This allows for side and rear armour hits.